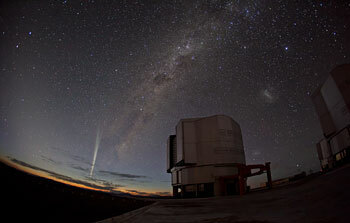 24 December 2011: The recently discovered Comet Lovejoy has been captured in stunning photos and time-lapse video taken from ESO’s Paranal Observatory in Chile. The comet graced the southern sky after it had unexpectedly survived a close encounter with the Sun. 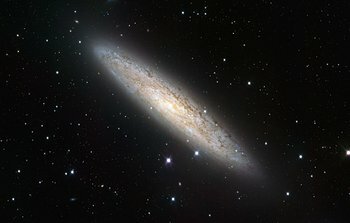 15 December 2011: The VLT Survey Telescope (VST) has captured the beauty of the nearby spiral galaxy NGC 253. The new portrait is probably the most detailed wide-field view of this object and its surroundings ever taken. It demonstrates that the VST, the newest telescope at ESO's Paranal Observatory, provides broad views of the sky while also offering impressive image sharpness. 14 December 2011: Astronomers using ESO’s Very Large Telescope have discovered a gas cloud with several times the mass of the Earth accelerating fast towards the black hole at the centre of the Milky Way. 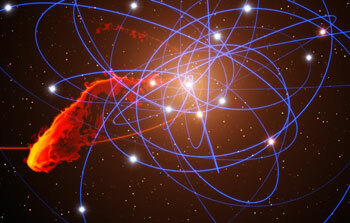 This is the first time ever that the approach of such a doomed cloud to a supermassive black hole has been observed. The results will be published in the 5 January 2012 issue of the journal Nature. 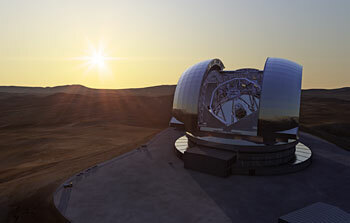 9 December 2011: The governing body of the European Southern Observatory, the ESO Council, has approved ESO’s budget for 2012. This includes preparatory work on the road to the European Extremely Large Telescope (E-ELT) site at Cerro Armazones and the start of development of some very challenging optical components for the telescope. With several ESO Member States now having committed their part of the required additional funding, the final approval for the whole E-ELT programme is expected in mid-2012. 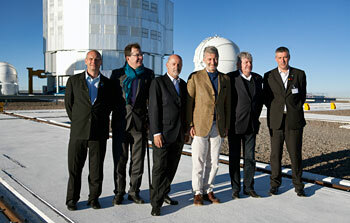 8 December 2011: The heir apparent to the throne of Belgium visited ESO’s Paranal Observatory, accompanied by a business delegation exploring future opportunities for European industry within the context of ESO’s European Extremely Large Telescope project. 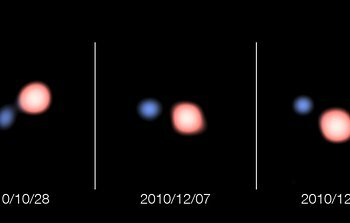 7 December 2011: Astronomers have obtained the best images ever of a star that has lost most of its material to a vampire companion. By combining the light captured by four telescopes at ESO’s Paranal Observatory they created a virtual telescope 130 metres across with vision 50 times sharper than the NASA/ESA Hubble Space Telescope. Surprisingly, the new results show that the transfer of mass from one star to the other in this double system is gentler than expected. 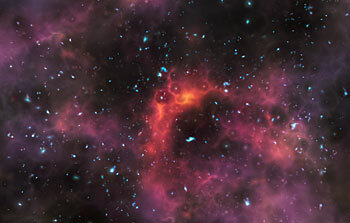 5 December 2011: ESO's Very Large Telescope has picked up the fastest rotating star found so far. This massive bright young star lies in our neighbouring galaxy, the Large Magellanic Cloud, about 160 000 light-years from Earth. Astronomers think that it may have had a violent past and has been ejected from a double star system by its exploding companion. 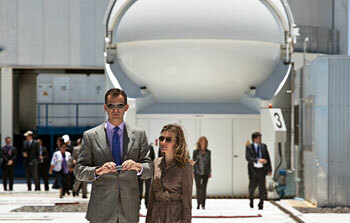 24 November 2011: On 24 November 2011 ESO’s Paranal Observatory in Chile was honoured by a visit from Their Royal Highnesses the Prince and Princess of Asturias. 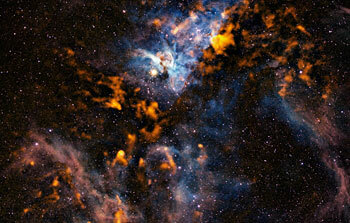 16 November 2011: Observations made with the APEX telescope in submillimetre-wavelength light reveal the cold dusty clouds from which stars form in the Carina Nebula. 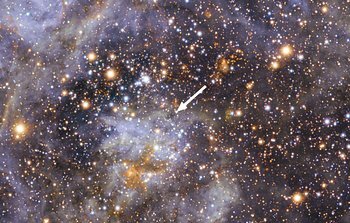 This site of violent star formation, which plays host to some of the highest-mass stars in our galaxy, is an ideal arena in which to study the interactions between these young stars and their parent molecular clouds. 11 November 2011: New observations indicate that the asteroid Lutetia is a leftover fragment of the same original material that formed the Earth, Venus and Mercury. Astronomers have combined data from ESA’s Rosetta spacecraft, ESO’s New Technology Telescope, and NASA telescopes. 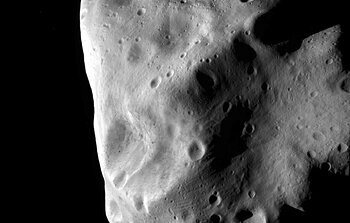 They found that the properties of the asteroid closely match those of a rare kind of meteorites found on Earth and thought to have formed in the inner parts of the Solar System. Lutetia must, at some point, have moved out to its current location in the main asteroid belt between Mars and Jupiter. 2 November 2011: An international team of astronomers has used the brief but brilliant light of a distant gamma-ray burst as a probe to study the make-up of very distant galaxies. Surprisingly the new observations, made with ESO’s Very Large Telescope, have revealed two galaxies in the young Universe that are richer in the heavier chemical elements than the Sun. 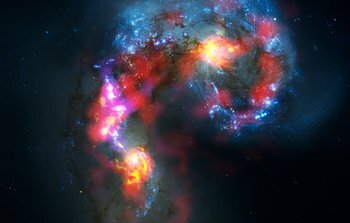 The two galaxies may be in the process of merging. Such events in the early Universe will drive the formation of many new stars and may be the trigger for gamma-ray bursts. 26 October 2011: Astronomers have accurately measured the diameter of the faraway dwarf planet Eris for the first time by catching it as it passed in front of a faint star. This event was seen at the end of 2010 by telescopes in Chile, including the Belgian TRAPPIST telescope at ESO’s La Silla Observatory. 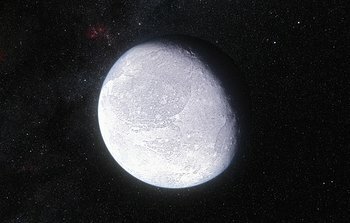 The observations show that Eris is an almost perfect twin of Pluto in size. Eris appears to have a very reflective surface, suggesting that it is uniformly covered in a thin layer of ice, probably a frozen atmosphere. The results will be published in the 27 October 2011 issue of the journal Nature. 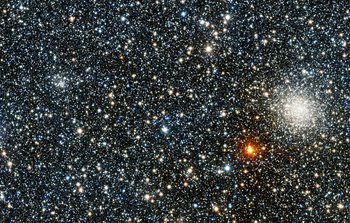 19 October 2011: Two newly discovered globular clusters have been added to the total of just 158 known globular clusters in our Milky Way. They were found in new images from ESO’s VISTA survey telescope as part of the Via Lactea (VVV) survey. This survey has also turned up the first star cluster that is far beyond the centre of the Milky Way and whose light has had to travel right through the dust and gas in the heart of our galaxy to get to us. 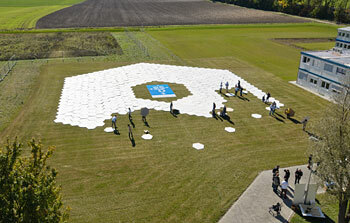 17 October 2011: On Saturday 15 October, the European Southern Observatory (ESO) opened the doors of its headquarters in Garching bei München, Bavaria, Germany, to the public. Throughout the day, thousands of visitors had the chance to help build a full-size mock-up mirror of the largest planned telescope in the world — the European Extremely Large Telescope (E-ELT) — and to experience many other aspects of ESO’s work. 13 October 2011: At a ceremony today in Santiago, Chile the Chilean Minister of Foreign Affairs, Alfredo Moreno and ESO’s Director General, Tim de Zeeuw, signed an agreement regarding the European Extremely Large Telescope. 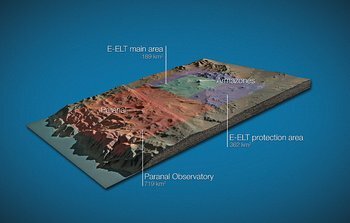 This agreement between ESO and the Chilean government includes the donation of land for the telescope, as well as a long-term concession to establish a protected area around it, and support from the Chilean government for the establishment of the E-ELT. 12 October 2011: Scientists have used ESO’s Very Large Telescope to probe the early Universe at several different times as it was becoming transparent to ultraviolet light. This brief but dramatic phase in cosmic history — known as reionisation — occurred around 13 billion years ago. 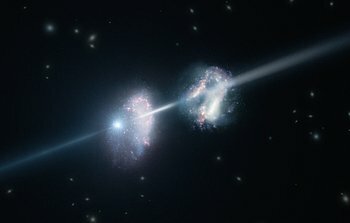 By carefully studying some of the most distant galaxies ever detected, the team has been able to establish a timeline for reionisation for the first time. 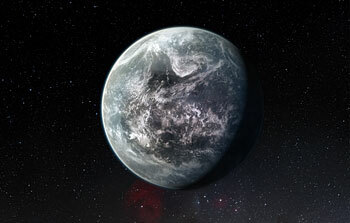 They have also demonstrated that this phase must have happened quicker than astronomers previously thought. 3 October 2011: Humanity's most complex ground-based astronomy observatory, the Atacama Large Millimeter/submillimeter Array (ALMA), has officially opened for astronomers. The first released image, from a telescope still under construction, reveals a view of the Universe that cannot be seen at all by visible-light and infrared telescopes. Thousands of scientists from around the world have competed to be among the first few researchers to explore some of the darkest, coldest, furthest, and most hidden secrets of the cosmos with this new astronomical tool. 28 September 2011: Astronomers have used ESO’s Very Large Telescope to image a colossal star that belongs to one of the rarest classes of stars in the Universe, the yellow hypergiants. 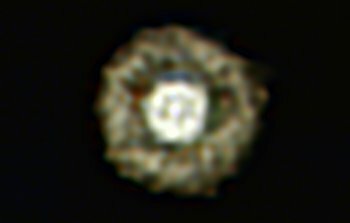 The new picture is the best ever taken of a star in this class and shows for the first time a huge dusty double shell surrounding the central hypergiant. The star and its shells resemble an egg white around a yolky centre, leading the astronomers to nickname the object the Fried Egg Nebula. 21 September 2011: A new image from the Wide Field Imager on the MPG/ESO 2.2-metre telescope reveals the Lambda Centauri Nebula, a cloud of glowing hydrogen and newborn stars in the constellation of Centaurus (The Centaur). 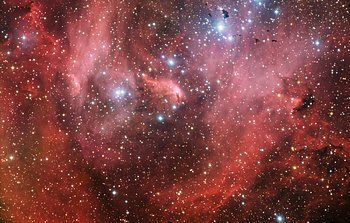 The nebula, also known as IC 2944, is sometimes nicknamed the Running Chicken Nebula, from a bird-like shape some people see in its brightest region.